In the past five years of research, one thing I've learned is that Error-free Genealogy isn't possible. I don't know about you, but I'm definitely human, as I seem to make a lot of mistakes. For awhile I was sure my great great grandfather, Samuel, and my great grandfather, Barney, were in Canada from May 1904 to July 1907. I don't think I'd be the only person to make that assumption after reading the below border crossing document. 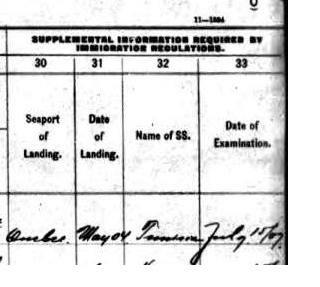 It wasn't until I found the May 1907 passenger manifest that I realized they were in Canada only two months. I still am somewhat surprised that the same hand could write two 7s so differently a few inches away from each other. That is the same hand, isn't it? Then there are the oversights I don't have anything to blame but myself - such as when the year I type into my database isn't what appears on the document. Even the most careful individual occasionally makes typographical errors. Hopefully they aren't as embarrassing as the tattoo above. I've learned to keep this in mind when looking at the work of others. It doesn't matter if it is a family tree at Ancestry, Genealogy, Wikitree, or FamilySearch. It doesn't matter if it's a printed genealogy that contains sources, or doesn't contain sources. Sources only provide an easier way for me to check to see if mistakes were made; they don't provide me a reason not to check. I recently followed the citations listed in a family genealogy and came to a different conclusion than the author.